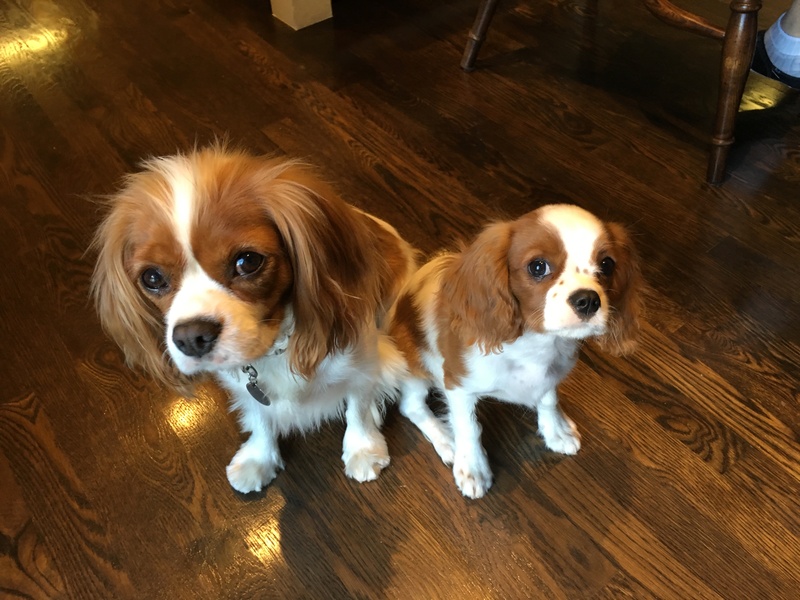 Charlie (Left) is a two-year-old King Charles Caviler Spaniel who lives in Santa Monica with four-month-old Chase. Ever since Chase was brought into the home, Charlie has started marking in the house. Charlie is also dog reactive on the leash and disagrees with attempts to clean by attacking the mop or vacuum. Due to a physical limitation, multiple people are involved in minding these dogs which is likely why Charlie is acting out. Dogs naturally identify the authority figure and social structure when they live in a group. If the dog doesn’t see or perceive any human as the authority figure, its quite common for them to nominate themselves. To help Patty and the dog’s guardian better understand each other, I went over some non verbal forms of communication as well as the escalating consequences I use when a dog is not listening or engaging in an unwanted behavior. Make a hissing sound like a cat to disagree. I use this sound when I want to say; No, Don’t Do That or Don’t Even Think About Doing That. I suggested that they match the dog’s intensity with the intensity of their hiss and to only hiss once per incident. When the dog continues to engage in unwanted behaviors or fails to respond to the hiss, the next consequence is to stand up abruptly and run to face the dog. This is the most commanding position a human can take. Once they stand up, they need to keep the dog in front of them, turning and pivoting if the dog moves to the right or left and waiting for the dog to stop moving before the humans move away. The next consequence is to march right at the dog until it moves away and sits, lays down or turns sideways to the human. As with the previous consequence, the dog needs to be stationary before the human moves off. The last consequence is to put the dog on the leash and step on it a few feet form the collar. This is my version of a doggy time out. When I put a dog on a leash this way, I wait for it to sit first; then slide the foot on the leash close to the dog to take off the tension. Then once the dog lays down and returns to a completely calm state, I take my foot off the leash. If you take it off, pet t or tell it a good job, the dog usually goes back to what it was doing. So we leave the leash on the dog for a few moments (but keep it in constant observation to be sure it does get the leash tangled and hurt itself) to be sure it doesn’t get back into trouble. If the dog stays calm, then the handler can take off the leash a minute or two later. By consistently applying these escalating consequences when the dog gets out of line, the humans will be able to quickly communicate to the dog what is and is no longer allowed. But when a dog thinks its in a position of authority over humans (Like Charlie currently does), it can easily get into trouble as humans don’t usually act like followers. This often causes the dog to get stressed out and can intensify their reactions when attempting to control of correct a person, animal or situation. This was instantly apparent when the housekeeper Patty brought out a broom to mop the floor. The instant he saw it, he started to stare at the mop with a lowered head tracking its every movement. As soon as it got too close to him, he lunged forward to nip and correct it. I put Charlie on a leash and had the guardian repeat the action again so that I could correct Charlie’s behavior. After a handful of corrections, Charlie stopped staring at the mop so intensely. He only needed 1-2 more before he got them message and simply watched as Patty mopped the floor all around him. After Charlie showed that he no longer viewed the mop as something to correct, I had Patty take the leash and mop the floor while keeping the dog next to her. As she did this, Charlie was looking in the direction of the mop but without any concern or reaction to its movements. When we finished up with the mop, Patty mentioned that Charlie acted even worse with the vacuum so I had her bring that out. This time, instead of correcting with the leash, I had her stop and put the hand vacuum on the floor the instant Charlie started to react to it. As soon as she stopped, she put the dog into a sitting position so she could offer some positive reinforcement for his obedience. By associating the action (Movement) of vacuuming while also offering a treat, we were able to change the dog’s perception of the vacuum as a threat. By the time we actually turned on the vacuum cleaner, the dog was so calm he didn’t even blink. Now that we had addressed some of Charlie’s issues, it was Chase’s turn. Being a puppy, we started out with some basic obedience, the sit. I went over a few additional simple commands with Chase and stopped there. Because of the guardian’s physical issue, she was starting to feel a little overwhelmed so I promised we could stop there and schedule another session in a month so that they can practice these first few commands first. Now we were ready to take Charlie out on a walk to change how he reacts and acts around other dogs. I fitted him up with a Martingale collar and showed Patty how to apply the special twist to the leash to stop Charlie from pulling and give her more control if he gets reactive around other dogs. Before heading outside, I went over how to hold the leash offer any corrections to Patty as well as the rules I use for a structured walk; stay in your position, no stopping and sniffing and no marking. Once outside, we practiced the leash techniques as we walked back and forth right outside the house. At first Patty kept some tension on the leash after correcting instead of letting the leash go slack right after. Its important to keep the tension off the leash. It should only happen for a fraction of a second when a correction is needed. Patty also started to pull the dog back by holding her arm slightly behind her as we walked. This is a natural reaction, but because it puts tension on the leash, I made sure to mention it to Patty so she can be careful to avoid doing so in the future. Once Patty felt comfortable, we headed out into the beautiful Santa Monica neighborhood she regularly walks the dogs in. The first dog we encountered was a high energy Labradoodle puppy who was a challenge to meet with Charlie. But due to the Martingale and the new rules and structure we practiced at the house, Charlie was able to act civil and not act aggressively. We continued on our walk and after a few moments, we ran across a smaller dog yipping behind the fence in his front yard. I used this opportunity to show Patty how to disagree with Charlie and put him into a calm state by correcting him the second he started to stare or lower his head at the other dog. It will take time and practice before Charlie stops reacting to other dogs he sees on walks. The work his guardian, Patty and the rest of the staff put in will have a correlating impact on how quickly Charlie adopts a new more balanced behavior. But by the end of the session, the dogs were both much calmer, were listening to their guardian and handlers right away and engaging in new desired behaviors instead of jumping up or barking at them. In another month, we will pick things up and build on what we learned in the next session in Malibu!